|and the Arabs on its side. by its nature and timing. fighting the Nazis in the Second World War. their deaths without a fight. rwm | eVy presents to Claudia Morse Evans a rendering of the Joseph L.
ever enriched by the home for the elderly that bears his name. The naming of the Jewish home for the aged as The Joseph L.
care facility scheduled for opening this Summer. support for the State of Israel. Dorothy Kautbord, for their assistance in fund raising. official community-wide dedication of the Center this Fall. include i sealed, left lo ngbt] Mrs.
Ciaadta Morse r>an&. re dangaier*. Ir. Peter Million, Mr. and Mrs. William Sidney Brandt, Mr. Alvin Schottenfeld. keinstock. Senator Moynihan, Mr. and Mrs.
ft. Ethel Graine, Mrs. Sylvia Ellis and Mrs.
h. Rocky Forrest, Mrs. Shirley Dannett, Movnihan, Mr. and Mrs. Walter SeW. Mr. Arthur Graine, Mr. Alvin Schottenfeld, Mr. Sam Meyers. Senator Daniel Patrick Moynihan with Mr. Myron Nickman. Mr. Herbert Dannett and Mr. Sam Gordon. hemp: I would >av "no"
think they can't be overcome. me the key to Israeli-U.S. Congressman Jack Kemp and Konni Epstein. David, and lor good reasons. Stymie a loch in kop. Lore! garian Jews during WW ||. I have the right to exist." and Israeli troops in Lebanon. A strange way to treat an ally. have been denied exit permits. the nation in which they lived. sional v otes lor this program. the instructor for this course. a Round Rohm Match and to also learn what the Federation is all about. surroundings put together with skill, imagination and care. ^ together in the company of compatible people their own age. the dance attracted over 200 young Jewish singles. For more information call 689-7700.
non members tor eight weeks. and Israel'$! Call Sara Glenn at 689-7700 to register. part of their No School Holida> starting on Thursday. in Fort Lauderdale and much, much more! tax and move it up to 1983. We tried that in 1977.
going to the senior Americans. that are added to the system. not been for Menachem Begin. thing weren't done by the U.S.
would have to do something. a very very courageous leader. Group on the Block? NO!!! evening, April 17 at 7:30 p.m.
will be the installing officer. sure to bring your husbands. on April 24, 25 and 26. Thursday, April 21 at 1 p.m. I oan on Gun Club Road. ensuing >ear will be held. during the summer of 1982. John I. Leonard High School. u-ual. coffee will be served. are invited, bring your friends. opportunity to visit the spa. first president of the new unit. 22nd Ave., in Boynton Beach. All meetings are at 7:30 p.m.
April 19 at 12:30 p.m. A pro! .1 Independence Day at Camp Shalom, 12:30-4 p.m.
B'nai B'nth Mitzvah Council, 9:30 a.m.
Jewish Congress. 12:30 p.m. Hadassah Tikvah, 1 p.m.
University Women Boynton Beach, 11:30 a.m.
Beach County Region, 9:30 a.m.
[this way if they can." o niorc than ten bullets. k given a spring cleaning. ed |he outer Ghetto walls. fcanl! d> ^hcy Put UP "'ft"
dared is of great significance." Channel 5 with host Phyllis Shever Girard. * L'CHAYIM Sunday, April 17, 10:30 a.m. 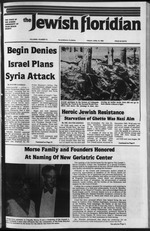 The Jewish Listener's Digest, a radio magazine. April 17, 10 p.m. WHRS-FM Stereo 91 with host Dr.
Simon Silverman Israel Independence Day Program. ISRAELI DIARY Thursday, April 21, 10 p.m.
saturated fat with no cholesterol. And it's certified Kosher, too. Fleischmann's Gives Every Meal A Holiday Flavor. of Washington, D.C. and U.S.
New Crisis for Soviet Jewry." returns of the Czech's service. D.C. He worked for the U.S.
P. Moynihan's chief of staff. College in 1969, a M.Sc. Econ. School in 1973. Robert D.
to Egypt, aid to Lebanon . Nazi Germany in the 1930's. bying in Congress for Israel. to live in freedom and dignity. the America of 200 years ago. of every person in the country. someday sbe will be a nurse at Hadassah. American University. The future bride attended America! Tours in New York. A November wedding is planned! Emma, you have every reason to kvell. Mazol tov to Margie and Harold Ochsteinon the recent! Bob Carter, Artistic Director of the Actor's Repertory! Bantam Books. This is the story of a middle-aged man who! of the Palm Beaches of American Mizrachi Women. Ada! Anshei Sholem of West Palm Beach. the solid gold flute of renowened area musician and! by Handel, Haydn, and Mozart was presented. Sandy has been a student of the clarinet since age eight! and an avid flutist for the past 15 years. He has performed! and New Jersey Symphony Orchestras. has practiced medicine in Palm Beach for nearly two! business over 70 years and do all types of plumbing. We also sell and service major appliances. Across From Palm Beach Dodg. aid, "It was like a dream. has always been in our hearts. exciting ideas for your condo group, club or organization. !!! AND MUCH MUCH MORE!!! Wsn Manager" at (305) 656-8800.
inagierDr.^w. Palm Beach, Fla. 33401 (305) 655-8800. Every Room with Private Bath. and Dinner (from 6:30 to 8:30 pm). rush off the golf course or tennis courts. tainment that's second to none. gets in the way of fun! Your host for three generations. will be here on April 21.
bins at 689- 03 to register. places, both day or night. P.S. Jack is our "youngest"
impact on so many people. for the four day convention. OF THE PALM BEACHES. INC.
the Jewish Community Center, Jewish Community Day chamber during the balloting. lib and Children's Service of Palm Beach County, Inc.
erroneously reported in last week's Floridian. among (hem, was fatally shot. deterrent to an Israeli attack. thing n a Fre Computer? of Palm Beach County, Inc.
FLORIDA HEAT AND COME ON UP! Social Hall, at 315 N. "A"
the corner of Southern Blvd. home lox, stock and bagel. tween our country and Israel. will be included in the serv. Palm Beach, FL 33401. by deadline of April 15.
attach a clear black and white photograph. Feldman. Sabbath services, Friday 8:15 p.m. Saturday 9:30 a.m.
a.m.. Sunday and Legal Holidays at 9a.m. services, Friday at 8:30 p.m.
Beach, FL 33411, Phone 793-0643. Cantor Albert Koslow. Mondays and Thursdays at 9 a.m. oamruay at y a.m.
Leat Orazi. 1-287-7732. Friday Service 8 p.m.
servn.es 8.15 a.m. and 6:30 p.m. I nduy ol every month at 8 p.m.
a.m. Torah Study with Rabbi Singer. Sabbath morning services 10:30a.m. Rabbi Stephen Adams, Phone 1-569-0180. President: Dr. Seth Coren. ooldman. 825 Lantern Tree Lane, West Palm Beach 33411 (793-2700). *". Kabb. Samuel Silver, President, Bernard Etish. Friday service! rather than be captured alive! WE'RE NOT PART OF A CONGLOMERATE. Marvin Rr/nik (*ntnr Sonnv u,vill Ar,hur|a Henry KWn **W "*" **k **""
Ask about "Guaranteed Security**"", Florida's only total pre-need plan. Memorial Chapel. Weat Palm Beach. Funeral Chapels, West Palm Beach. the result of a deliberate act. al Chapel. West Palm Beach. morial Chapel, West Palm Beach. Charles N., 78, of 3000 N. Flakier Drive. Futura Stone of Palm Beach County, Inc.
partnership, Individuals wills, trusts and estate planning. write todav -Us a necessity. Limited Tim. oiler Onlv Acl TODAY"
Offer limited lo one per tamilv. anytime through May 31st 1984.